Beefeater Gin and Pernod Ricard. First produced at the Chelsea Distillery (established 1820) in the late 1870’s by pharmacist and tea merchant James Burrough, it was originally known as Burrough’s Gin. The Burrough’s family sold the company to Whitbread in 1987; Whitbread sold the Beefeater brand to Allied Domeqq in 1991; and Allied Domeqq were purchased by Pernod Ricard in 2005. Whilst this brand of Gin is popular globally it is a particularly big seller in the USA - in the 1960’s it held 75% of the Gin market and today is the No.3 premium selling brand across North America. We believe it is fair to say that Pernod Ricard have put a lot of time, effort and money into re-marketing this brand and its offspring (e.g. Beefeater 24, Beefeater Summer etc.). Despite the changes in ownership across the last few decades, the same family-held recipe is used, with the same production techniques using maize and barley grain. Made by steeping the botanicals for 24 hours, before slowly redistilling inefficiently in copper pot stills, this labor-intensive method taking about 7 - 8 hours for each final distillation. 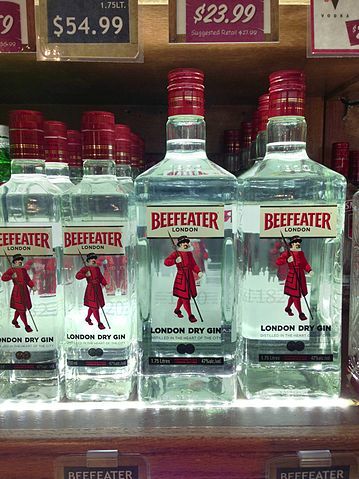 Beefeater use 4 copper pot stills, all operating at different stages of the Gin production cycle. It is bottled and bonded in Scotland and around 2.5 million cases are produced annually, for us to imbibe around the world. We are informed the Beefeater distillery is due to open its doors in 2013, with a visitor’s center for the general public. 47% (94 Proof) in a few markets including the USA and 40% (80 Proof) elsewhere. The 9 Botanicals are: angelica roots and seeds, coriander seeds, juniper berries, liquorice, orris root, Seville orange peel, Spanish almonds and Spanish lemon peel. It changed its name from Burrough’s Gin to Beefeater’s Gin, to associate itself with the Yeomanry Guard and Warders of the Tower of London, and thus emphasise its London roots. The yeomanry were created in 1485 from experienced military personnel, to guard prisoners and the crown jewels held in the tower. No one is sure where the nickname originated but one belief is they were permitted to eat the King’s beef (possibly as part payment for their services). On the nose are a soft aroma of citrus, juniper and spices with a hint of fruit. The palate initially discerns citrus (especially orange) and juniper; this is followed by a woody taste with coriander and lavender; finally leaving you with a dry finish of orange, pepper and some pleasant bitter tastes (no doubt from the coriander) with a hint of anise. It has the reputation of being the driest London Dry Gin and quite simply put, is a strong, classic, old style, full flavored Gin – a true Gin lovers Gin. Obviously, if your palate is more inclined to the lighter Gins this may be too strong and dry. However, if you crave a classic tasting Gin…this certainly fits the bill – we cannot think of any traditional Gin based mixed dink this is not suitable for. It is therefore no surprise to find, this is the standard Gin used by many bars around the world - both at domestic homes and in commercial settings. The only criticism we can find is whilst this is relatively smooth, it is not the smoothest of Gins, and suspect it might be due to the high ABV. The lower ABV version is somewhat diluted and as a consequence loses a lot of it's aroma and taste. Thus in our opinion, as a sipping Gin, it is not as good by comparison to other smoother Gins on the market – which are often found at higher prices than Beefeater. Double Gold Medal, San Francisco World Spirits Competition, 2013. Gold Medal, San Francisco World Spirits Competition, 2009. Double Gold Medal, San Francisco World Spirits Competition, 2008.